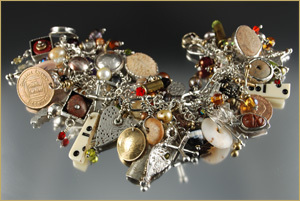 Bracelets at Barbara Briggs Designs - custom, unique, one-of-a-kind silver jewelry. Baubles, Bangles, and Beads...so goes the song from "South Pacific". They are what I like to make! A bevy of goodies is shown here to give you an idea of custom items that you may want to special order. Prices range from $200 to $1,000 depending on materials used and the current price of precious metals. 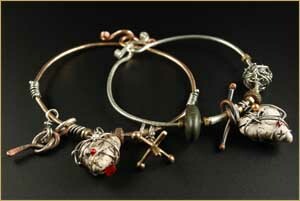 Mixed Media Bangles - These feature a variety of charms including beads, coiled sections, and Faux Bone™ which I've textured and wire wrapped. They glide along hammered lengths of bronze or silver wire. Each is one of a kind. $148 to $248 depending on materials used. Elaborate Charm Bangles - Sterling and fine silver, wrapped silver coils, charms, lampworked glass and beads of semi-precious gem stones glide along lengths of 14 gauge sterling. Each is one of a kind. $275 and up depending on materials used. Charm Bracelets - These bracelets can be loaded to the max as the one shown here or you may wish yours to more subdued with fewer charms. Almost everything under the sun is on this bracelet! Materials used may be sterling, fine silver, bronze, copper, polymer clay, river stone, semi-precious beads, coins, dice, altered dominoes, shell casings, resin pieces, pearls, crystals...and the list goes on! Prices start at $250 depending on materials used and the current price of silver. 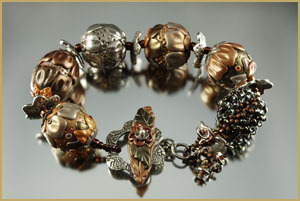 A loaded bracelet like the one shown here is $950. 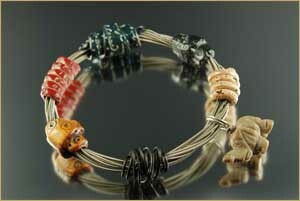 Novelty Bangles - Here's a twist...guitar wire is used for the foundation of my novelty bangles. 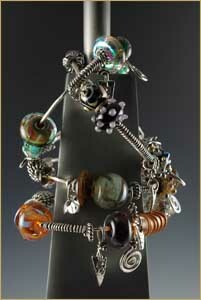 They are graced with a variety of textured, colorful polymr clay beads. 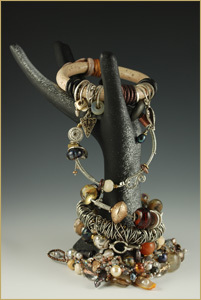 The Novelty Bangle shown here also sports a tiny carved elephant of river jasper. Each is one of a kind. $150 and up. The Potpourri Bracelet - With a silver metal clay bead and clasp, a seed beaded bead, and polymer clay beads, this floral themed bracelet is a bit like a potpourri...a mixture of things. You can custom order this bracelet in your choice of coloways for $650 or you can order the Potpourri Bracelet kit and make one yourself! You'll find the kit in my Etsy shop.